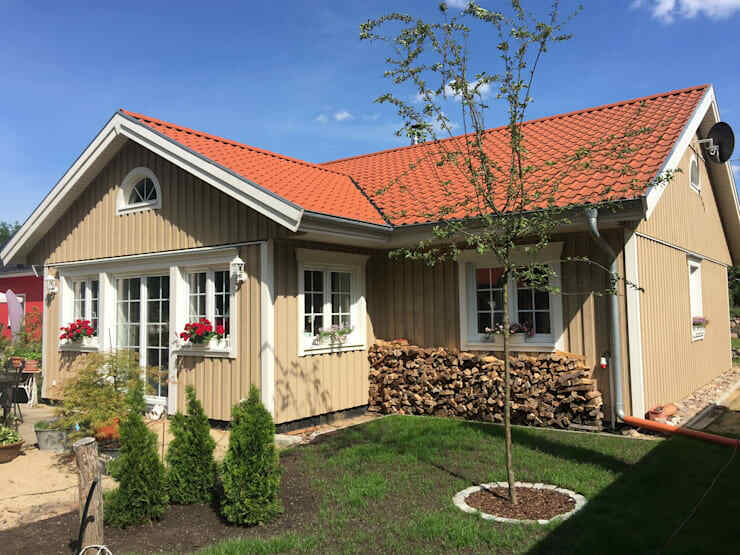 Normally when we think of our dream house, the typical fairytale cottage comes to mind with a beautiful entrance, gorgeous architecture, wood and lots of plants, trees and colourful flowers. This is not so far from reality however! In fact, today at homify we are going to show you 10 homes straight out of the fairytales, we hope will inspire you to add a little magic to your house. The key to achieving this end result is to use suitable materials such as wood, bricks or tiles for the facade. Another important element is the right choice of colours, which preferably need to be warm colours or pastel colours. This will illuminate every detail of the entrance. Lastly, a fundamental requirement is to add a touch of greenery. Plants, trees, flowers and grass play a very big role with it comes to a wonderful, fairytale home. Without further ado, let's begin our magical tour! This is a very quaint and understated country cottage that gets it charm in the form of the details incorporated throughout. 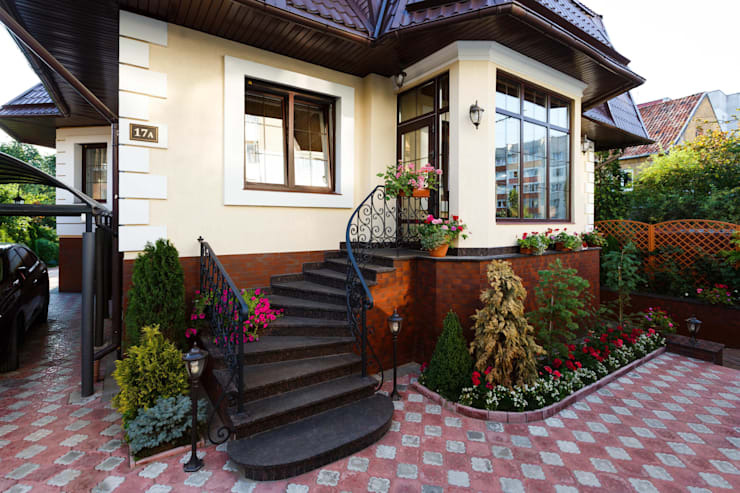 The wrought-iron staircase brings a gorgeous touch to the facade, working in harmony with the peach-coloured patterned stone paving and cream walls. The dark wood used for the window frames add a homely touch – just like a fairytale. If you really want to enhance your facade and add a bit of fairytale charm, add some vibrant colour to it. 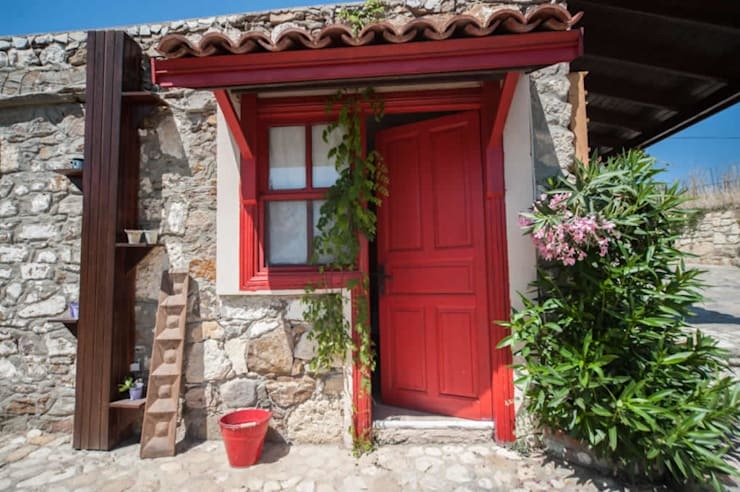 You can paint the front door a gorgeous colour or the window frames or shutters. This will illuminate the natural tones used throughout the rest of the facade, but will ensure that your home sticks out. It will be the most charming house on the block! In this design, by professionals Monica Khanna Designs, we can see how a touch of Balinese style can create a home that looks like it comes out of the Arabian Nights! 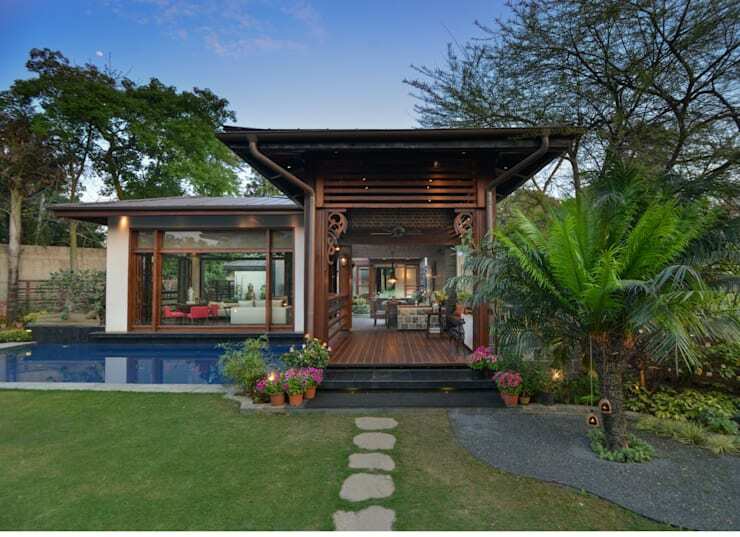 Framed by a very exotic and tropical looking garden, this home is absolutely exquisite. The dark wood featured throughout the facade works in harmony with the greenery around it. If you like this style, you may also be interested in it for your interior design. Have a look at this modern living room with an Asian touch. Tiling always makes for a very cozy country style. They are also a great material to use because they are durable and last in all weather conditions. The key to a charming home is the materials that you use. 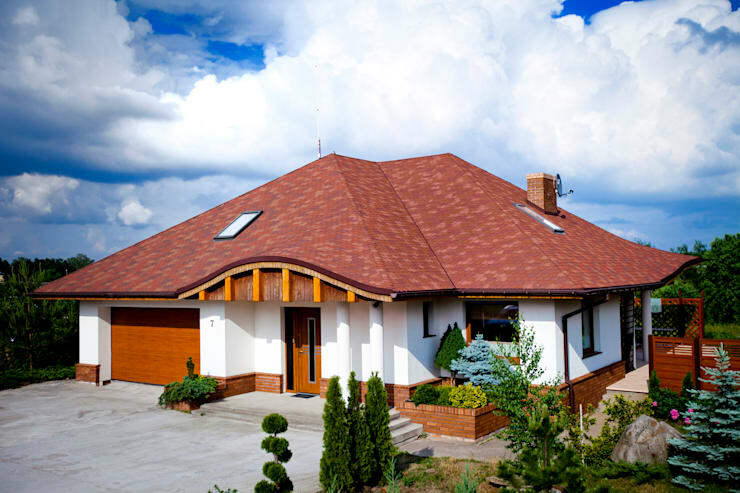 In this design, we can see how the reddish tiles complete the look of this home perfectly. 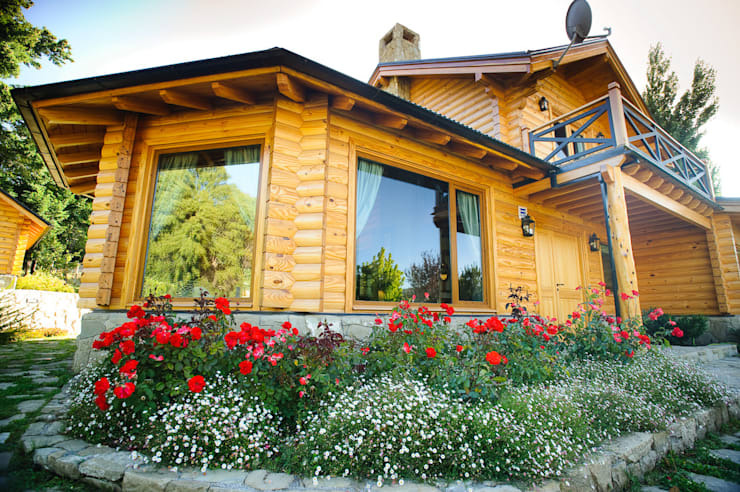 If there is anything that reminds us of a fairytale house, it is the use of wood. If you open up any fairytale, you'll find a wooden house featured in it! Why? Because it is a very simple material that is incredibly aesthetically pleasing. It also naturally insulates the interior and makes the facade look very cozy. In this design, we can see how a wooden facade works in harmony with the garden too! You don't have to go for a traditional or typical piece of architecture when it comes to your fairytale home. Why not go for something quite out of the ordinary? A house can take on all sorts of innovative and unique designs, creating a home that is incredibly attractive and eye-catching as well as cutting-edge. In this design, we can see how the unusual shape of the roof creates a gorgeous piece of architecture that would turn any head! Thatch houses also feature in many fairytales including the Three Little Pigs and other stories by Brothers Grimm. 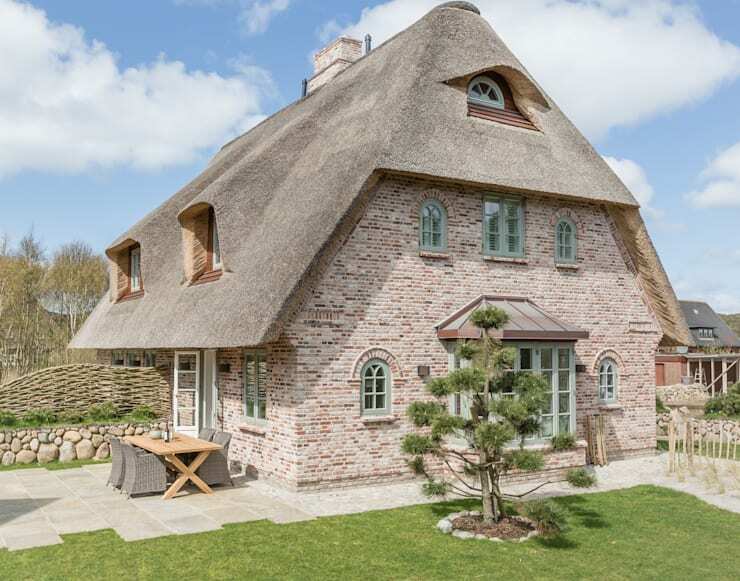 The brick slabs and thatch roof create a distinctly country look and feel, while each detail in the design from the outdoor furniture to the shape of the windows serve to enhance this design. Thatch is also a wonderful and budget-friendly material to use for the roof of a home. 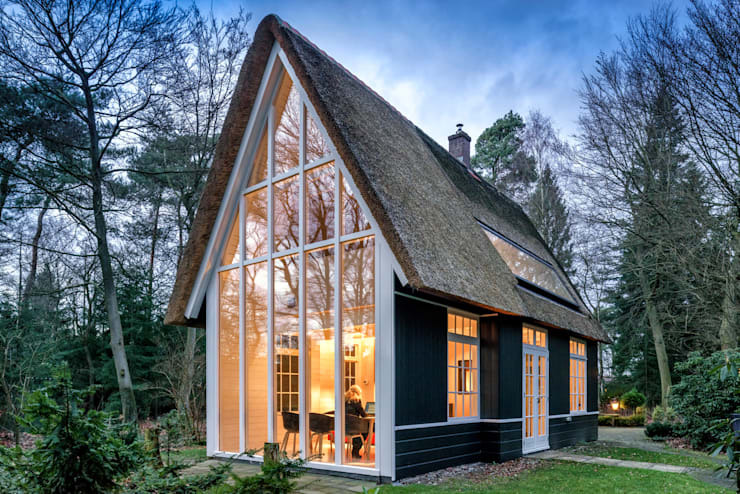 Perhaps this straw-roofed home with all the cozy comforts will inspire you. If the environment works in your favour, setting the tone for a fairytale home, then all that you need to do is incorporate your home into the surrounds. 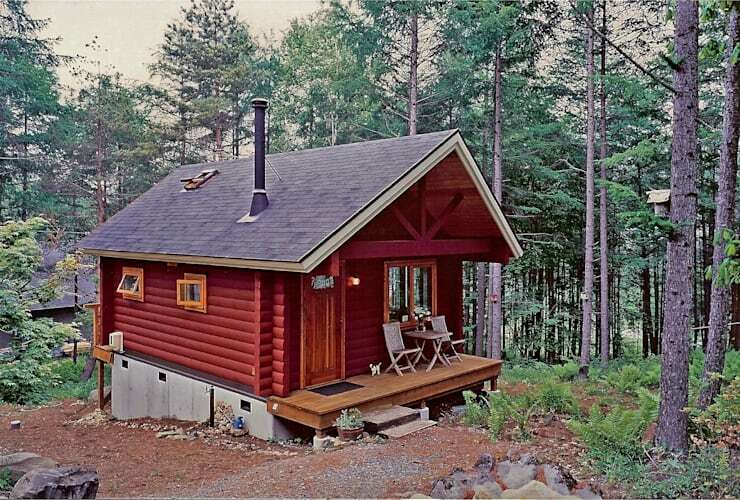 These designers built a gorgeous red log cabin that utilizes the surrounding views and landscapes. This creates a very impressive yet small home that looks like it belongs in a real fairytale. If wood and thatch aren't your favorite materials, go for stone. Stone will create the impression of a castle-like home that is safe, homely and protected. 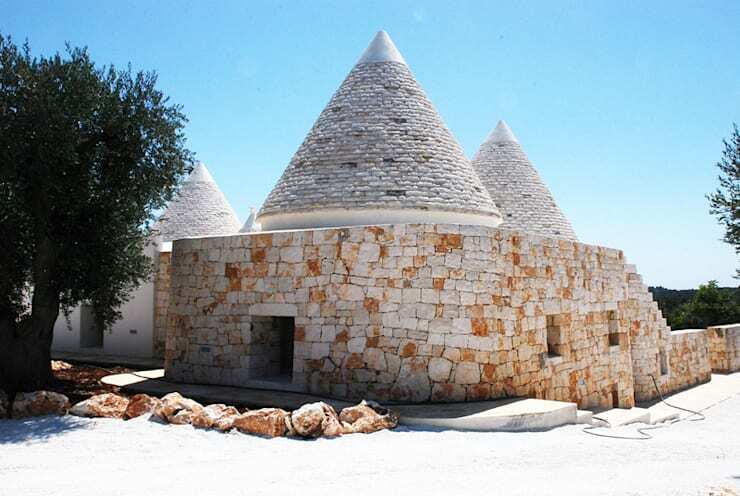 In this design, by Paola Rebellato Architects, we can see how much fun can be had with stone. You can create turrets and pathways that give a home a very striking effect. This last design looks like the fairy godmother made all of the residents' dreams come true! This house not only has characteristics of a cozy cottage, but it also incorporates some modern and contemporary details that place it right here in the 21st century. Don't you love how the one wall is made entirely from glass? If you've enjoyed this ideabook, you'll love looking at this family's rustic fantasy home. Which is your favourite fairytale home?